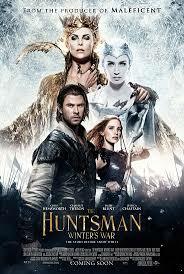 The Huntsman: Winter's War (2016) - The review | ♡ Memorable life, take a picture! I bought the ticket online so we had to collect the ticket at the counter. But before we went into the cinema, of course we had to stop and buy popcorn, salty please! :P Mr H said he was hungry so he bought himself a hot dog. Picture taken from Google - The poster. The story was about the two sisters, Ravenna and Freya. I can't remember Freya from the previous sequel so maybe she is a new plot that the Director wants to focus on this time. Ravenna, as usual, was so powerful that she reign every province that she had conquered. Freya fell in love with a man and was already pregnant with the man's child. However, as fate would have it, Freya saw the man murdered her baby. She was so frustrated that she turned into an ice queen. She went far away to a new kingdom and started to reign there. Since she was heart broken, she vowed herself not to fall in love again. She then killed all the adults in her kingdom and took the children away and force them to be her knights. The rule was that they were not to fall in love with each other. I though it was quite ironic since Freya seems to consider these children as hers, so that means she still has the feeling of love right? Anyway, the children grew up and a couple fell in love with each other. Another irony here, hehehe. Freya was angry that she tried her best to separate them. She kept the girl and let the boy went away, thinking that the boy had already died. Picture from Google - Who can deny love? On the other hand, Snow White had took over Ravenna's kingdom and Ravenna's spirit went into the magic mirror. It was Freya who freed her sister and now her sister is trying to control her kingdom. That is when the rival between the two sisters started. Freya also found out the truth about the murder of her baby. I like the part where the boy replied to Ravenna's comment, "Well, maybe love cannot conquer all, but it can conquer you!" hahaha. Love definitely wins at the end.